IN most history text books, one will find that many areas around the Borneo Island to be littered with ancient kingdoms and sultanates. Most of the well-known ones obviously are Brunei or Bo-ni or Po-ni or the various ancient names of Brunei; Kutei, Bolongan, Pasir, Banjarmasin, Sukadana, Pontianak, Mempawah, Landak and Sambas. 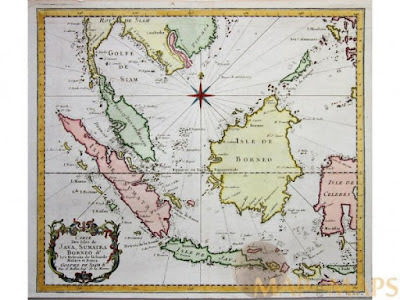 Other than Brunei, most of these kingdoms were found in the southern and western parts of the Borneo Island. However, in the north and north east, other than Brunei, there are no ancient states or kingdoms stated. Sarawak and North Borneo as separate states were in the maps only towards the end of the nineteenth century. One answer could be is that the Brunei Kingdom had been in control of these areas for so long that in most maps, only the Brunei kingdom was ever known. However if we go deeper, we will find that there are other kingdoms or states which existed in these areas in the past which had been published in major writings. Two major resources that we can refer to are the Salasilah Raja-Raja Brunei (Brunei Royal Genealogical Table) and the other is a book written during the Majapahit Empire called the Nagarakertagama believed to be written in 1365. There are actually several versions of the Salasilah Raja-Raja Brunei and they do contain variations and differences in their write ups. However the one that is mostly referred to is the one used by Amin Sweeney which is printed in the Journal of the Malaysian Branch of the Royal Arts Society (1968). When the first Brunei Sultan, Sultan Muhammad, was appointed, Sultan Johor awarded a few items and also several states which included Kalaka, Saribas, Semarahan, Serawak and Mukah. From the names, it can be deduced that Barune(ng) is Brunei, Sawaku is Sarawak, Kalka is Kalaka, Malano is Melanau and Samadong is Sadong (Semarahan). So, based on these two major primary sources, it can be almost certain that these five kingdoms existed in the past on the north and north-eastern part of Borneo. In a paper entitled ‘Sejarah Awal Barat Laut Borneo’ presented by Sanib Said in the third Borneo History Conference (2003), there are a number of archaeological artefacts found in the said areas which can support the claims of the existence of these five kingdoms. Sarawak’s claim can be traced to Santubong, which is at the mouth of the Sarawak River. A number of gold artefacts had been found in the area. This can be taken to prove that with the existence of these gold artefacts, that the area attracted many traders and travellers in the past especially traders from India in the earlier stages. It is also possible that the existence of these gold artefacts may lead to Santubong/Sarawak to be connected with place name of Survanabhumi (Golden State) by the Indians or Iabadiou by Ptolemy in 150 AD. In 1949, Tom Harrison of the Sarawak Museum did an archaeology study around the area and found many Chinese pots. Based on the evidence of these pots and the shards, the area had a permanent settlement as far back as the 7th century and until the 10th or 14th century. At the same time, more than 40,000 tons of iron-slags were also found in the same area. The existence of these iron-slags mean that the shipping industry then was a major industry around the area. As for Samarahan and Sadong, the archaeological evidence was similar to the evidence in Santubong. Many shards were found in Gedong, in the valleys of the Sadong River. Almost 80,000 pieces together with hundreds of other artefacts such as beads, coins and gold pieces. This shows that the whole place had been in continuously in existence. This is actually supported that in the 1850s, James Brooke together with Spenser St John travel to this area and had actually found a Hindu Religion artefact. Pottery pieces were also found in the Kalaka area. In Nanga Kalaka, more than 9,469 shards were found whereas in Tebing Tinggi, more than 41,762 shards were found. These shards however pointed out to a much younger place compared to Samarahan. These shards were from potteries in the 16th and 17th centuries. However it does prove that the Kalaka area was also constantly inhabited. The case for Saribas was not as straight forward. Saribas claim came about from a poem found in 2002 entitled ‘Syair Tarsilah Cetera Abang Godam dan Temenggong Qadir Negeri Saribas’ where the poem recounted how Saribas was founded. The case for Melanau is similar to Saribas. So far there is no archaeological evidence and the claim for statehood rely mainly on writings of historian such as JL Moens. Much more archaeological work needed to be done in the latter two areas so that their claims for ancient statehoods can be entertained.